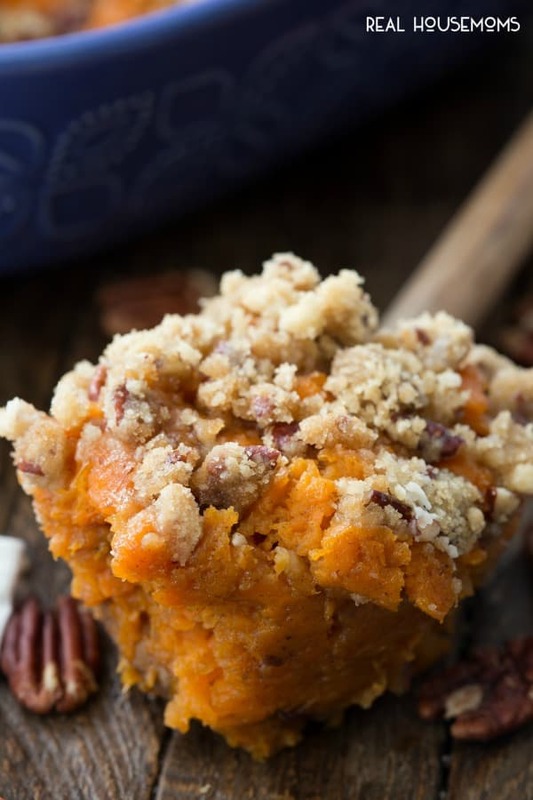 Easy Sweet Potato Casserole has creamy, spiced sweet potatoes topped with an irresistible pecan brown sugar streusel. It’s the perfect side dish for any holiday meal! For every holiday, there’s a sweet potato casserole on my family’s dinner table. Everyone in my family has a different way of making their sweet potatoes – my mom likes to add orange juice, my aunt tops hers with caramelized apples, and my husband’s mom has this amazing Mother-in-Law Candied Yams recipe. 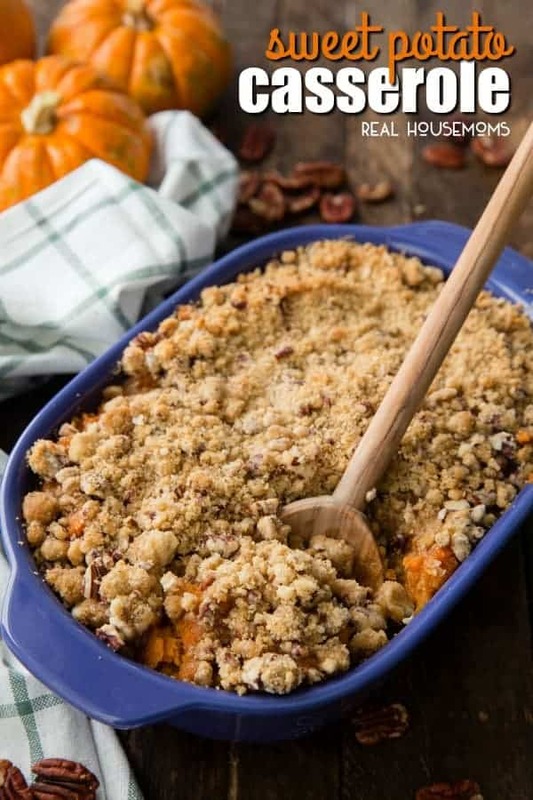 This sweet potato casserole recipe with crunchy brown sugar streusel topping is my personal favorite, and I love that it can even be made in ahead of time! This dish starts with the sweet potatoes. I like to roast my sweet potatoes whole and scoop out the insides, but you could peel and boil chunks of sweet potato if you prefer. 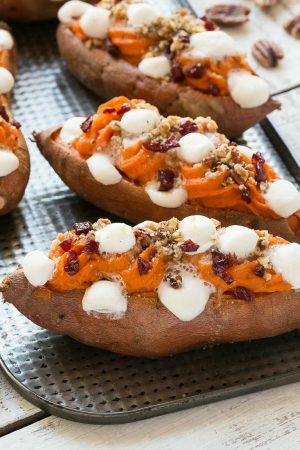 The sweet potatoes are mashed with a little butter, sugar and warm spices like cinnamon and nutmeg. You can use a potato masher for a more coarse and rustic mash, or if you like your sweet potatoes silky smooth, blend them in the food processor. I tend to use a potato masher because I like the extra texture in my sweet potatoes. The streusel topping is a simple mixture of brown sugar, melted butter, flour, and pecans. Some people like sweet potato casserole with marshmallows, but I like to mix things up and do a steusel topping too. I like to mash my potatoes, sprinkle the topping over them, and then refrigerate the casserole until I’m ready to bake it. If you choose to make your casserole in advance, you’ll need to add about 10 more minutes to the baking time to make sure it’s cooked through. 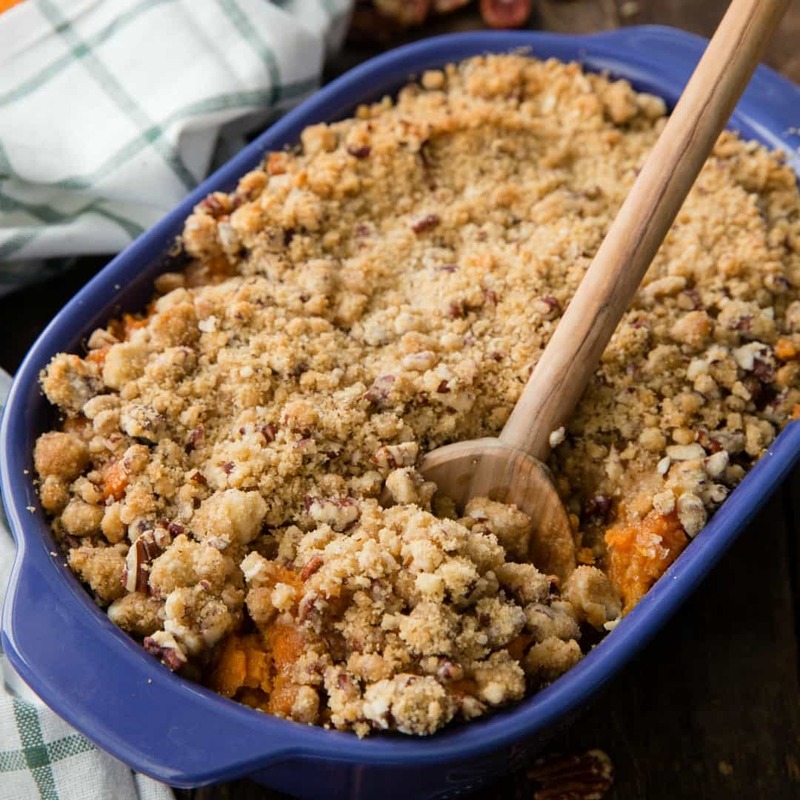 This easy sweet potato casserole can easily be doubled to serve a crowd. I often make a double batch for larger gatherings because it goes quickly, even the kids love it! 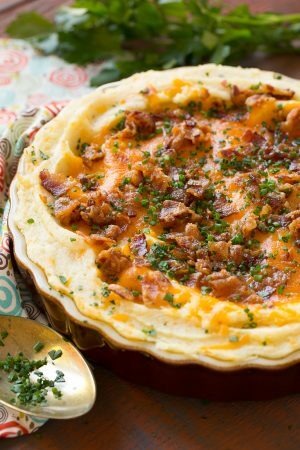 Whether you’ve got a special occasion or simply want a hearty fall side dish, easy casserole recipes will be welcomed at your table! 2-Quart Baking Dish: A square baking dish is a must-have for home cooks. This one comes with a sturdy lid for easy storing and transporting your favorite dishes! 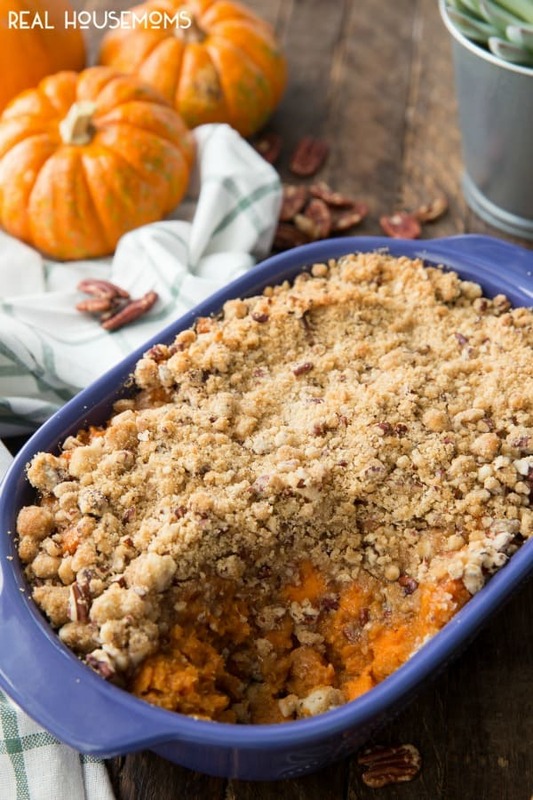 Easy Sweet Potato Casserole has creamy, spiced sweet potatoes topped with a pecan brown sugar streusel. It's the perfect side dish for any holiday meal! Preheat the oven to 350 degrees. Line a sheet pan with foil and coat with cooking spray. Prick the potatoes with a fork and place them on the pan. Bake the potatoes until tender, 45 minutes to an hour. When the potatoes are cool enough to handle, cut them open, scoop out the insides and place the potatoes in a large bowl. Add the 4 tablespoons of butter, milk, brown sugar, spices, and egg to the bowl. Use a potato masher or food processor to mash or blend the potatoes until mostly smooth. Grease a 9-inch square pan or 2-quart baking dish with cooking spray. Spread the sweet potato mixture evenly in the pan. In another bowl, mix together the brown sugar, flour, melted butter and pecans until crumbly. Sprinkle the crumb topping over the sweet potatoes. Bake for 25-30 minutes or until topping has lightly browned. You can substitute 1/4 cup orange juice for the milk in this recipe! Next time you may want to try putting them in the microwave for a few minutes first, the little bit of pre-cook helps to shorten oven time. Hope that help Mandy and thank you! I just finished serving this and it was AMAZING!!!!! I only have two thumbs for a thumbs up, but if i had more I’d give those! Yummo! I’ll share my thumbs!! Thanks so much I’m glad they were a hit.